Printed postcards are making a come back. But, you don’t have to go on holiday to send them. Print some of your own to send to friends, family and colleagues. 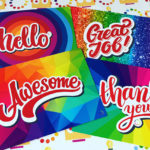 They are a great way to remind people that you’re thinking of them, to say thank you, ‘you’re awesome’, ‘you did a great job’ or a simple ‘hello!’. Whether you fancy some for your work life or personal life, call us for a price list on 01332 418377. Need help with artwork? Not a problem, we can design postcards bespoke to you or your business. Tip: a set of four different designs will cover most occasions. We can collate them into sets for you too.